Today, we're taking a look back at a short-lived brew from New Belgium that showed up in their mixed folly packs. Apparently it wasn't a hit, as it was retired just a few short months after its debut. Designed with no particular style in mind and brewed with lemon peel and sustainable espresso from Brazil, Giddy Up was a strange brew. We're going with American Amber Ale, which seems the closest fit. First whiff is full of sweeet caramel, toffee, latte. Then, a hint of lemon scone flavor from the addition of lemon peel. Body is creamy, resonant of espresso, yet the finish is bright, even a bit frisky. An ale to git along with. I have to say, it's all very intriguing. Appearance: A clear and deep rust-colored body with a solid finger of eggshell head. Decent chunky lacing. Aroma: Roasted malt body with lots of medium-roasted coffee. Not much as far as hops or lemon coming through, but the coffee is brilliant. In a blind smell test, there's an outside chance I'd peg this as coffee, not beer. Taste: It's still very much all about the coffee in the flavor profile as well. The profile is of mildly bitter coffee flavors firmly in the medium-roasted coffee territory, so don't be expecting a dark-roasted espresso. The backbone is somewhat reminiscent of 1554 (although much weaker) and nicely sweet. There might be a splash of citrus in there, but it's hard to pin down. Mouthfeel: A smooth, medium body with average carbonation. Drinkability: Moderate drinkability. The coffee might get somewhat tiring after a while. 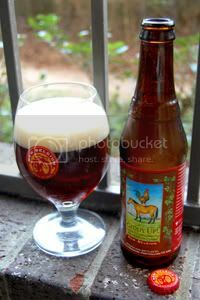 Verdict: Giddy Up is somewhat one-dimensional beer, but it does what it does perfectly, having the best recreation of coffee flavors I've ever experienced in a beer. If you're looking for medium-roasted coffee flavors in a beer, you can't go wrong here. It works perfectly as part of a mix-pack, but I'm not convinced I'd be picking up a lot of six-packs. Note: While this review is being published in 2010, the tasting notes contained within were taken when the beer was fresh in early 2009.